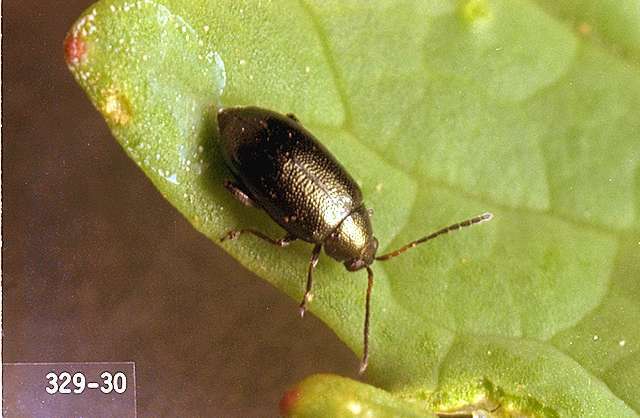 Pest description and crop damage Flea beetle adults are metallic greenish brown to black in color and from 0.06 to 0.12 inch long. They derive their name from their well-developed hind legs; when disturbed, they jump like fleas. The larvae live in the soil, are slender, whitish, and about 0.25 inch long when mature. Adult beetles chew small holes in leaves, giving them a sievelike appearance. The cotyledons of emerging seedlings are especially susceptible to damage. The larvae feed on underground parts of the plant. High populations of flea beetles feeding on seedling plants can result in stand loss. Foliar damage to mature plants is not considered to be damaging economically. Flea beetles contribute to the spread of various plant diseases. Biology and life history Most flea beetle species have similar life cycles. Adults overwinter in trash around field margins. They become active in late March through May. Flea beetles lay their very small eggs in May in the soil around the plant, on the leaves, or in cavities hollowed out in stems. The larvae feed on the foliage, mine the leaves, or attack the roots, depending on the species, usually from June to mid July, when pupation in the soil occurs. Adults emerge from July through early September and feed a short time before overwintering in trash around field margins. Depending on the species, there are one or two generations each year. When the flea beetles on seedlings are migrating from hosts outside of the field, most of the infestation will be localized within 200 feet of field borders. Check the distribution of leaf feeding to see if this is the case, and consider border treatments only. If high populations exist 1 to 2 weeks before harvest, and foliage is declining as a food source for the beetles, spot treat according to the flea beetle distribution. "Trap crops" such as radish or daikon may help lure flea beetles away from the main crop. This has not been tested in the Pacific Northwest. Floating row covers or other screening can be used to exclude the beetles during seedling establishment of high-value crops. Flea beetles can be vacuumed off foliage, but this must be repeated frequently. Reinvasion of plants can be rapid. bifenthrin/imidacloprid (Brigadier) at 0.06 to 0.0.95 lb ai/a. PHI 7 days. REI 12 hr. Retreatment interval 7 days. Limit 5 treatments after bloom. Do not exceed 0.24 lb ai/a imidacloprid and 0.5 lb ai/a bifenthrin. carbaryl (Sevin 4F) at 0.5 to 1 lb ai/a. PHI 14 days. REI 12 hr. Retreatment interval 7 days. Limit 4 treatments. Do not exceed 6 lb ai/a per season. chlorantraniliprole/thiamethoxam (Voliam Flexi) at 0.1 to 0.172 lb ai/a. PHI 7 days. REI 12 hr. Retreatment interval 7 days. Do not exceed 0.172 lb ai of thiamethoxam or 0.2 lb ai of chlorantraniliprole per acre per growing season. clothianidin (Belay) at 0.05 to 0.067 lb ai/a foliar, 0.15 to 0.2 lb ai/a soil. PHI 7 days foliar, 21 days soil.REI 12 hr. Retreatment interval 10 days. Do not exceed 0.2 lb ai/a per season. cyclaniliprole (Harvanta 50SL) at 0.036 to 0.054 lb ai/a. PHI 1 day. REI 12 hr. Retreatment interval 5 days. Limit 3 treatments. Do not exceed 0.22 lb ai/a per year. cyfluthrin (Tombstone) at 0.038 to 0.05 lb ai/a. PHI 0 days. REI 12 hr. Retreatment interval 7 days. Do not exceed 0.2 lb ai/a per season. cypermethrin (Holster) at 0.05 to 0.1 lb ai/a. PHI 1 day. REI 12 hr. Allow at least 7-days between applications. Do not exceed 0.4 lb ai/a per season. dinotefuran (Venom) at 0.088 to 0.131 lb ai/a PHI 1 day. REI 12 hr. Do not exceed 0.263 lb ai/a per season. Retreatment interval 7 days. malathion (Malathion 8) at 1.0 lb ai/a. PHI 7 days. REI 12 hr. Limit 3 treatments. Retreatment interval 5 days. imidacloprid (Admire Pro) at 0.047 lb ai/a. PHI 7 days. REI 12 hr. Retreatment interval 5 days. Do not exceed 0.23 lb ai/a foliar per season. No soil application for flea beetle. imidacloprid (Provado) at 0.0475 lb ai/a. PHI 7 days. REI 12 hr. Allow 5 days between foliar sprays. Do not exceed 0.23 lb ai/a per season. thiamethoxam (Platinum) at 0.078 to 0.172 lb ai/a. PHI 30 days. REI 12 hr. Do not exceed 0.172 lb ai/a per season.